1. The field life cycle. 2. Petroleum agreements and bidding. 2.1 The invitation to bid. 2.2 Motivations and form of bid. 2.6 Unitisation and equity determination. 3.2 Exploration methods and techniques. 3.2.1 Introduction to geophysical methods. 3.2.2 Seismic acquisition and processing. 4.2 Rig types and rig selection. 4.3 Drilling systems and equipment. 5. Safety and the environment. 5.3.1 Environmental impact assessment (eia). 6.2.2 Types of reservoir fluid. 6.2.3 The physical properties of hydrocarbon fluids. 6.2.4 Properties of hydrocarbon gases. 6.2.6 Fluid sampling and pvt analysis. 6.2.7 Properties of formation water. 6.2.8 Pressure - depth relationships. 6.2.9 Capillary pressure and saturation-height relationships. 6.3.2 Coring and core analysis. 6.3.5 Logging/measurement while drilling (lwd/mwd). 6.3.6 Pressure measurements and fluid sampling. 6.4.3 Net to gross ratio (n/g). 6.4.8 Integration of core and logs. 7.1.1 The area - depth method. 7.1.2 The area - thickness method. 7.2.1 The input to volumetric estimates. 7.2.2 Probability density functions and expectation curves. 7.2.4 The monte carlo method. 7.2.6 Three point estimates : a short cut method. 8.1 The role of appraisal in the field life cycle. 8.2 Identifying and quantifying sources of uncertainty. 8.4 Expressing reduction of uncertainty. 8.5 Cost-benefit calculations for appraisal. 8.6 Practical aspects of appraisal. 9.1 The driving force for production. 9.3.1 Major differences between oil and gas field development. 9.3.2 Gas sales profiles; influence of contracts. 9.3.3 Subsurface development of gas reservoirs. 9.3.4 Surface development for gas fields. 9.3.5 Alternative uses for gas. 9.4 Fluid displacement in the reservoir. 9.6 Estimating the recovery factor. 9.7 Estimating the production profile. 10.1 Estimating the number of development wells. 10.2 Fluid flow near the wellbore. 10.4 Production testing and bottom hole pressure testing. 10.7 Completion technology and intelligent wells. 10.9 Subsea vs. Platform trees. 11.1 Oil and gas processing. 11.2.2 Land based production facilities. 11.2.4 Satellite wells, templates and manifolds. 12. Production operations and maintenance. 12.1 Operating and maintenance objectives. 12.2 Production operations input to the fdp. 12.3 Maintenance engineering input to the fdp. 13. Project and contract management. 13.3 Cost estimation and budgets. 14.1 Basic principles of development economics. 14.2 Constructing a project cashflow. 14.3 Calculating a discounted cashflow. 14.6 Project screening and ranking. 15.1 Risk definition and unit of measure. 15.2 Summary of risk analysis techniques in exploration and appraisal. 15.3 Risk analysis for major capital investments in projects. 15.3.2 Project risk matrices and risk registers. 15.3.5 More complex problems – specific subsurface considerations. 16. Managing the producing field. 16.2 Managing the surface facilities. 16.3 Managing the external factors. 16.4 Managing the internal factors. 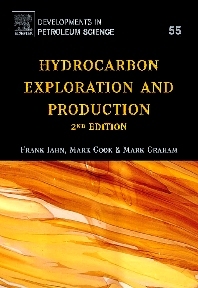 Hydrocarbon Exploration and Production, Second Edition is a comprehensive and current introduction to the upstream industry, drawing together the many inter-disciplinary links within the industry. It presents all the major stages in the life of an oil or gas field, from gaining access to opportunity, through exploration, appraisal, development planning, production, and finally to decommissioning. It also explains the fiscal and commercial environment in which oil and gas field development takes place. The book is written for industry professionals who wish to be better informed about the basic technical and commercial methods, concepts and techniques used in the upstream oil and gas business. The authors are the founders of TRACS International, a company which has provided training and consultancy in Exploration and Production related issues for many clients world-wide since 1992.